NORWAY has launched a new campaign to highlight the country’s cultural sides along with nature experiences to attract modern travellers. New numbers confirm that Norway is attracting an increasing proportion of the millennial travellers. Born between the 1980s and 2000, they tend to characterise themselves as ‘adventurers’ rather than tourists, and are looking for authentic experiences. With their new campaign, the Norwegian tourist board Visit Norway hopes to attract even more. “We wish to attract more modern travellers, and with this campaign we showcase the real and modern Norway, including a visit to the Opera house in Oslo, a sunset dinner in Bergen along with snowboarding at Stryn Summer Ski Centre and hiking in the north,” Director Brand Norway Cathrine Pia Lund from Visit Norway says. Renowned for its beautiful fjords, mountainous terrain and northern lights, Norway wants to shift focus on cities and towns that are within easy reach of the natural wonders, providing excellent opportunities to combine nature attractions with urban atmospheres consistent of Michelin starred restaurants, concerts and art galleries. In line with its youth focus, Norway is developing several new tourism attractions, one of them being the Cable Car in Loen that is ready to welcome guests May 2017 onwards. 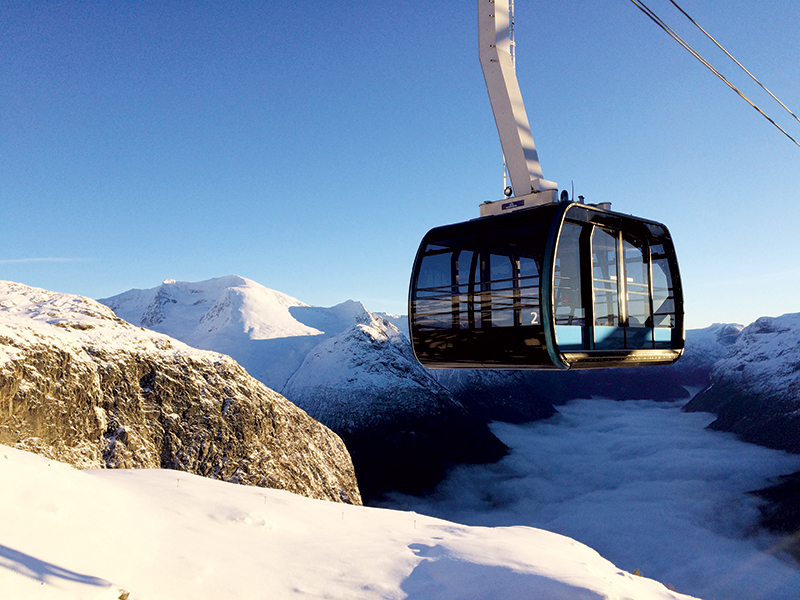 Named Loen Skylift, the cable car will transport visitors on the world's steepest aerial ropeway, over 1,000 metres above the Nordfjord, and provide breathtaking panoramic views over the fjord landscape. Some believe it may be the number one tourist attraction in Fjord Norway in the coming years. Promoted as one of Scandinavia's most exciting travel experiences, Loen Skylift makes the fantastic nature experiences in the area accessible to all. The view is breathtaking, with beautiful fjords in all directions, spectacular mountains and the Jostedalsbreen Glacier in the background. From Mount Hoven, guests may access several kilometres of built and signposted hiking trails, and in winter they may enjoy snowshoeing, cross country skiing and ski touring. The popular climbing route Via Ferrata Loen, with Gjølmunnebrua suspension bridge (the longest Via Ferrata Bridge in Europe), connects Mount Hoven. At the top, visitors can enjoy fine dining with local ingredients at the mountain restaurant, at the edge of the cliff, before taking the Cable Car back to Loen. Once operational, the project will help create jobs, supporting growth in the rural area, ensuring well-being both for those who live there as well as visitors.